I did my first shift last night with a work study student, and I couldn’t have been more excited! I got my start in that very library as a work study student so I was excited to have someone to work with and someone to hopefully make a positive influence on. I usually work by myself so it was nice to have another person to talk to, who understands the library, to run to grab books off the shelf, to help answer the phone or field reference questions. Sadly she is only working two days a week with me but I could get used to this! I want to share with you the first part of an essay I had to write for my Kent State SLIS application. Hacking a car: Is it really that easy? CNET On Cars – Car Tech 101: Hacking a car: Is it really that easy? Brian Cooley takes a look at the current state of cars and their potential for hacking. From Oculus Rift to Google Cardboard: Everything you need to know about VR! All style is relative. Some people will disagree with what this blog dictates is good style, and this blog would most likely disagree with them on what they think is good style. As you can imagine, this results in a situation in which there is no single list of men’s dress rules that are comprehensive and absolute. The following are a set of rules that The Fine Young Gentleman stands by. There are some rules that are immutable, such as the one that a man should match the metal of the bit on his loafer with the buckle on his belt with the metal on his suspenders with the buttons on his blazer with the metal of his cufflinks. Then there are some rules that have exceptions, such as the rule that a man’s socks should match the color of his pants. The Fine Young Gentleman’s rules are derived from a variety of sources including tradition, classic rules of men’s dress, common sense and personal taste. 1. Thou shall match the metal of the bit on his loafers, belt buckle, suspenders, blazer buttons and cufflinks. 2. Thou need not match the metal on his watch with the other metals he is wearing, however, it is preferable. 3. Thou can wear black shoes with a navy suit/pants. 4. Thou shall only wear black, brown or oxblood (burgundy) leather shoes for business dress. The only exceptions allowed are white bucks. Blue, green or any other colored shoes are inappropriate. 5. White bucks are badass. 6. Thou shall match the color of his socks with the color of his pants. As an exception, socks can be matched to something worn above the waist such as a man’s shirt, tie, pocket square or suspenders (braces in the UK). 7. Thou shall match the color of his belt to that of his shoes. This holds true in all situations except when wearing white bucks. 8. Thou need not match the leather on his watchband with that of his shoes and belt, however, it is preferable. 9. Thou shall wear a belt when wearing pants with belt loops. 10. Thou shall never, ever, ever use their belt to hold accessories like beepers, phones, Blackberrys, ID tags and/or keys. 11. If pants do not have belt loops they should have side tabs and/or buttons for use with suspenders (braces). 12. Thou shall never wear a tie and pocket square of the same pattern. The sports commentators who do so look like fools. 13. Thou shall not wear a French cuff (double cuff) shirt without a jacket. 14. Thou shall always doubt salespeople and in-store tailors opinions on fashion, style and fit. The stores they work for pay them, not you. Their motives are to sell products to who will buy them, not necessarily to who will look best in them. 15. Thou shall not wear slip on shoes with a suit. In fact, they should be avoided. 16. Thou can wear loafers with a suit, however, this is mostly practiced in America. 17. Loafers are badass, especially those with bits or tassels. 18. Thou shall not wear flat toe/square toe shoes. They should be avoided like the plague. They are cancerous to a man’s wardrobe. They are aesthetically offensive. Their sole purpose lies in showing men what not to wear. Money spent on these would have been better spent on Enron stock circa June 2000. 19. Thou shall only wear patent leather shoes for black tie (semi-formal) and white-tie (formal) occasions. Patent leather is never acceptable to be worn in a dress or causal setting. 20. Thou shall never wear a long necktie for a semi-formal (black tie) affair, even if that tie is solid black. 21. Thou can wear brown suede shoes for business dress. They are elegant and gentlemanly. 22. Brown suede shoes are badass. 23. Thou shall not wear Chesterfield coats, which are typically signified by a velvet collar, with anything of less formality than a suit. They should not be worn with business casual attire. 24. Thou shall not wear a tie without a jacket. If done so, he will run the risk of looking like a waiter at TGI Fridays. 25. Thou shall not wear suspenders (braces) without a jacket. Sorry hipsters. 26. Thou shall only wear suspenders (braces) that utilize buttons, not clips. Again, sorry hipsters. 27. Thou shall not wear a crew neck undershirt when the top button of a shirt is left unbuttoned. When leaving the top button unbuttoned thou shall wear a v-neck undershirt as The Dude does. The Dude abides. 28. Thou can wear brown suits for business dress. 29. Thou shall only wear shirts with white collars and white cuffs with a jacket. These shirts should not be part of a business casual wardrobe, that is, one where suits are not utilized. 30. Thou shall leave the bottom button of vest (waistcoat) unbuttoned. Except when wearing a double breasted or flat bottomed vest, in which case the bottom button should remain buttoned. 31. Thou should iron the collar of a shirt before wearing it. Creased collars caused by dry cleaning and hanging do not follow the natural circularity of one’s neck. 32. Thou shall utilize a pocket square when wearing a jacket. 33. Pocket squares are underrated, underutilized and most importantly they are badass. 34. Thou shall not wear a back pack/book bag when in business dress, especially when in a suit. Book bags are reserved for casual wear and students. 35. Thou shall not wear a shirt with any type of logo on it in a business setting, including when in business casual dress. These shirts should be reserved for casual wear. 36. Thou shall wear a tie bar at a slant, not horizontal. 37. Off color shirts with a white collar should have French (double) cuffs, regardless of whether of not the cuffs are white or the same color or pattern as the shirt. 38. Life is more fun in a tuxedo (dinner jacket). 39. Thou shall never button all three buttons of a three button jacket. Sometimes the top, always the middle and never ever ever the bottom. 40. Thou shall wear over the calf socks as opposed to crew socks whenever possible. For they are far superior in both form and function. 41. Thou shall not wear a solid black suit for business or professional activities. Save it for formal events and funerals. 42. Style is a state of mind. 43. It is impossible for a man to be considered well dressed if his shoes are in poor taste or of noticeably poor quality. For any good ensemble is built on a fine pair of shoes. 44. Thou shall not wear sport sunglasses with a suit. It’s like wearing socks with sandals; everyone else knows its wrong, why don’t you? 45. Thou shall not wear a sports watch with a suit. It would be like playing lacrosse in dress shoes, and no one wants to see that. 46. There should be no presence of logo or branding when wearing a suit. For example, do not wear a Polo shirt with the Polo logo on it under a suit jacket or a Burberry tie with the Burberry tartan (although the scarfs are fine). The emphasis of a suit should be the fit, not the brands it is worn with. 47. It is better to be overdressed than underdressed. 48. A man need not an excuse to wear a tie or jacket. In other words, a man need not an excuse to dress up. Despite the fact that in today’s society it seems he does need one. 49. Never, ever, ever wear a black dress shirt with a suit (or a dinner jacket/tuxedo for that matter). Just because they may be or may have been ‘on trend’ does not mean one will ever look good on you. 50. Thou shall take off his sunglasses when talking to someone else who is not wearing sunglasses. Unless thou is at the beach or pool. 51. Thou shall take off his sunglasses when inside. Even if thou art Bono. How many of you have had family members, friends, acquaintances, strangers, etc. ask you why you are in library school or give you a quizzical look and say something along the lines of “Don’t you know that librarianship is a dying profession?” or “But didn’t Google replace the need for librarians?” Of course, we all know that this isn’t true, but if there is anything I’ve learned over the past 2.5 years in library school, it’s that we must be advocates for our profession and, perhaps more importantly, ourselves. The reality is that we will probably never be able to stop advocating. So, I urge you to learn how to do this now, because if you want a long and successful career in this field, you will need this valuable skill. Making the move from middle management to the executive suite requires a healthy dose of confidence. Executives have to make critical, wide-reaching decisions, often with limited information and time—then persuade others to execute those decisions. Self-assurance is a must. Yet gaining confidence can be a struggle. The “Impostor Syndrome” is real: researchers at Georgia State University found that 33% of the high-achieving adults they interviewed did not feel they deserved their success. The Imposter Syndrome meant that sufferers opted out of important career opportunities, to their financial and personal detriment. Women in particular struggle with confidence. They often are less adept at moving forward after setbacks, reading temporary failures as permanent deficiencies, and they often have smaller professional social safety nets than men. 1) When in doubt, act. It’s the difference between running and stagnant water. When you’re stagnant, doubt and insecurities breed like mosquitoes. Dale Carnegie wrote that “inaction breeds doubt and fear. Action breeds confidence and courage.” Fear of failure can paralyze us, as we almost always overestimate the consequences. Build your confidence instead by taking action, often. 2) Do something outside your comfort zone each day. If we don’t stretch our comfort zones, they shrink. Constantly challenge and improve yourself, and you’ll become comfortable doing new things—and you will establish your identity (both to yourself and others) as someone who takes risks. Each new thing you try adds to your knowledge and skill base, and provides you with a foundation of competence. This is the bedrock of any successful career. 3) Put the focus on others. Choose to be conscious of others instead of self-conscious. Ask people questions. Turn conversations into a game where you try to find a connection with the other person. Give compliments generously, and volunteer to help others when you can. Looking for the best in others will help you see it in yourself. 4) Cultivate mentors. Their advice and connections are invaluable, plus you will make better decisions about opportunities thanks to their objective assessments of the pros and cons. And you will be much more willing to take risks knowing you have supporters who will help you get back up on your feet if you fail. 5) Keep self-talk positive. It’s hard to feel confident if someone puts you down all the time. It’s impossible if that naysayer is you. Watch how you talk to yourself. Is it how you would talk to a friend? If not, then make a change. 6) Eliminate negative people from your network. You absolutely need to invite and be receptive to constructive criticism if you want to grow as a professional and as an individual. But recognize that some people will never be happy with you or with life, and it is a waste of time to try to convince them of your worth. What’s more, their sour outlook on life is contagious. Learn to identify these people quickly, and move on. 7) Take care of your health. Make time for exercise, and get enough rest. Your body must be physically ready to take on challenges. 8) Do your homework. Keep up-to-date on the news in your industry, and know your company and department inside and out. If you have a challenging task ahead, prepare and practice in your mind. Nothing builds confidence like knowledge and preparation. 9) Watch your body language. Your posture and overall appearance affect both your mental state and how others perceive (and thus respond) to you. If you want to be a leader, you have to dress and act the part. Stand and sit up straight, make eye contact, and remember to smile. Wear the professional clothing of your industry. Eliminate the telltale signs of nervousness: excessive twitching, closed-off posturing (crossed arms and legs, hunched shoulders), and shallow breathing. 10) Practice gratitude daily. In a recent study of how successful people spend the first hour of each day, the No. 1 response was investing time in thinking about the things for which they are most grateful. Starting your day by saying “thank you” for the good in your life makes it more likely that you will approach the day’s challenges with the proper perspective. Like public speaking or leadership, confidence is a professional skill that can be improved. According to Dr. Peter Buckley of Georgia Regents University, “As you add experiences, you’re more likely to gain confidence. And with confidence, you will embrace new experiences.” Start growing your confidence today. 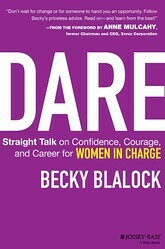 Becky Blalock is the author of the new book, “Dare: Straight Talk on Confidence, Courage, and Career for Women in Charge.” You can take a free quiz to measure your current confidence level at her website,BeckyBlalock.com.